BT published its numbers for 2011 this week. It revealed that its fibre “passes” 10 million homes. Of those, some 550,00 have subscribed to its Infinity VDSL fibre to the cabinet (FTTC) service. BT says it added 589,000 retail broadband customers. It claims this is 54% of the net additions of 1,085,000, and took its retail broadband customer base to around 6.3m, up 10% in the year. Ofcom’s Communications Market Report, published in August 2011, said, “More than two-thirds (67%) of households have a fixed broadband connection and 17% have a mobile broadband (dongle) connection.” That’s about 20 million homes, which puts BT’s share of the fixed broadband market at around 32%. Despite doubling the network frequency in the local loop, which should have pushed its top download speeds from 40Mbps to 80Mbps, BT did not refer to it in its report. Nor does it respond substantively to questions about the increase in speed actually experienced by customers. In early April, just after BT’s official speed upgrade, one of its resellers, the ISP Origin, provided its upload and download speeds to Thinkbroadband. 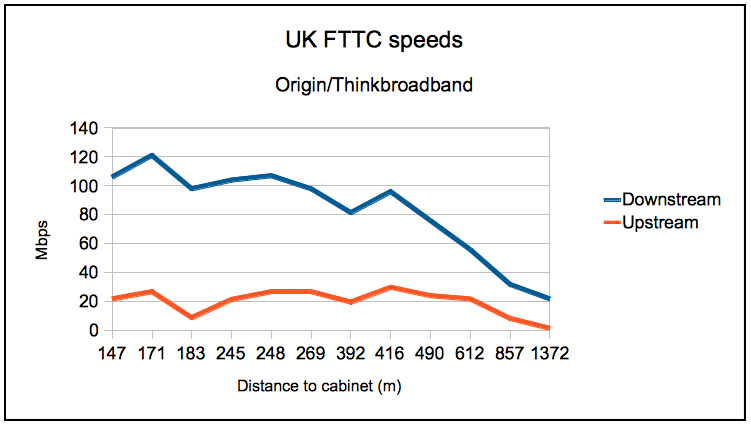 The graph shows clearly how speed degrades with distance from the street cabinet. The graph is not a smooth line because lots of things affect the user experience. They include distance to the cabinet, quality of the metal path (not every line is good quality copper), congestion on the link between the cabinet and the exchange, internal wiring in the customer premises, whether the modem or router is directly connected to the wall plug, whether the user is using Wi-Fi to connect, etc. The speed experienced by any individual is also increasingly affected by how many people in the premises are trying to connect at the same time, the so-called multiscreen syndrome. The graph shows that BT may be underselling its VDSL technology by claiming a top download speed of “up to” 80Mbps. The Origin figures suggest that anyone living within 500m of their street cabinet should get an 80/20Mbps download/upload service, and anyone closer in should do better. That is if they, like Origin, have a dedicated rather than a shared service. Points of presence of Digital Region’s dedicated VDSL FTTC service. As Origin puts on its website, “BT’s cabinets are shared between all BT customers, Sky customers, PlusNet Customers and any other ISPs that piggyback on their fibre. So you’ve got loads of customers all wanting the same superfast speeds at the same time all using the same cabinet. This means that to make sure customers all get a half decent service, the ISPs have to limit and manage the speeds. BTW, if you agree with that sentiment, you can join the 700-plus people who have singed Richard Brown’s petition for Ofcom to ban “up to” advertising here. Richard Brown, COO of Wispa, a Welsh communications consultancy, has sent Jeremy Hunt’s department of culture media and sport a final letter of notice before legal action, which is a kind of gentle nudge before the lawyers’ fee-meter goes into hyperdrive. Brown is mildly peeved, if that’s the right expression, for a number of reasons. Firstly, he wrote a book which explains in lucid detail how BDUK can get its job done for a fraction of the money it is paying KMPG to screw up the procurement of broadband in rural areas. His ideas have been supported by none other than Peter Cochrane, the former BT CTO, who has attracted headlines because of his damning evidence to the House of Lord enquiry into broadband. He is also ticked off because Ofcom has not had the courtesy to acknowledge receipt of his petition, signed by more than 600, calling for a ban on “up to” advertising of broadband speeds, which Brown claims, and Ofcom itself reports, are misleading. Finally Brown is irked by the fact that BDUK’s procurement framework for rural next generation broadband access, which was meant to deliver at least six bidders for the taxpayers’ £530m, has delivered only two, BT and Fujitsu. In practice, it appears that the odds are stacked in BT’s favour, and Fujitsu has still to confirm its on-going commitment to the framework process. So Brown has written to the DCMS, threatening legal action to stop BDUK under state aid rules from giving BT any money. Furthermore Brown is asking DCMS to refund him his share of the £530m, a sum he calculates as £8.98, whereupon he will cease his action. DCMS no doubt would like to laugh this off as a publicity stunt, but there’s a sting in the tail. Brown is asking for all the records relating to the pilot rural broadband projects as well as minutes of all meetings between DCMS and BT. In some quarters, these documents will generate more interest than Lady Chatterley’s Lover when it was unbanned. Normally, the courts might take the view that Brown’s action falls into the nuisance or vexatious camp, and chuck it out without a hearing. Brown says, “The action is legitimate on the basis that it is effectively money that is not the government’s or the department’s, it is simply in the custody of the the DCMS. As it is a custodial amount they have a legal obligation to demonstrate that it is being used appropriately (should they be requested to do so). As I have requested on a number of occasions that they do that, and they have failed to answer, I can demonstrate that they have failed to act, and so the only courses remaining are to forget it, or take some form of legal action. DCMS has 28 days to respond. This is the text of Brown’s letter to DCMS. As it has not been possible to find a resolution to this matter amicably and it is apparent that court action may be necessary, I write in compliance with the Practice Direction on Pre-Action Conduct. I respectfully request, for the final time, that the action of State Aid funding a private organisation cease. This action is detrimental to the benefit of the UK citizens and is to be conducted without our express consent. In ceasing the action it will then be possible for those who have the knowledge to best advise the DCMS on how to allocate the funding in a more appropriate manner. The sum of £8.98 is claimed in advance of this action. This has been calculated by the dividing the announced BDUK fund (£530m) by the 2001 census population (59m) and deriving the amount that a single individual will bear in new or paid taxation. Should we receive this sum we will cease our legal considerations. I can confirm that we would be agreeable to mediation and would consider any other system of Alternative Dispute Resolution in order to avoid the need for this matter to be resolved by the courts and would invite you to put forward any proposals in this regard. In closing I would draw your attention to section II (4) of the Practice Direction which gives the courts the power to impose sanctions on the parties if they fail to comply with the direction including failing to respond to this letter before claim. I look forward to hearing from you within the next 28 days, should I not receive a response to my letter within this time frame then I anticipate that court action may be commenced with no further reference to you. Andrew Ferguson, whose comments on our “Lies, damn lies and broadband data” story have made an extensive contribution to our understanding of some of the more arcane features of broadband in the UK, has come up with an interesting analysis of BT and Talk Talk’s costs and prices. It suggests BT’s gross margin on fixed costs for its copper ADSL2+ service is around 169% while the margin on its top end 80/20 Infinity fibre to the cabinet (FTTC) service is around 57%. That may explain why it is reluctant to give up copper for a more fully fibred network. It also shows how much fat is available to it for price wars with other network operators. Of course Williams walking a well-trodden path down which firstly the man who created IBM, Thomas Watson Senior, and more recently Microsoft’s Bill Gates have wandered. Watson said the global market for mainframe computers was about five. Gates said 640k (of RAM) should be enough for anyone. Fortunately for their firms, they were both wrong, and I’m pretty sure Williams is too. If he is right, then we are already at “peak broadband” and BT is finished both as a growth business and as an engine of growth. Perhaps we’ll have a clearer picture on Thursday when BT publishes its 2011 results. 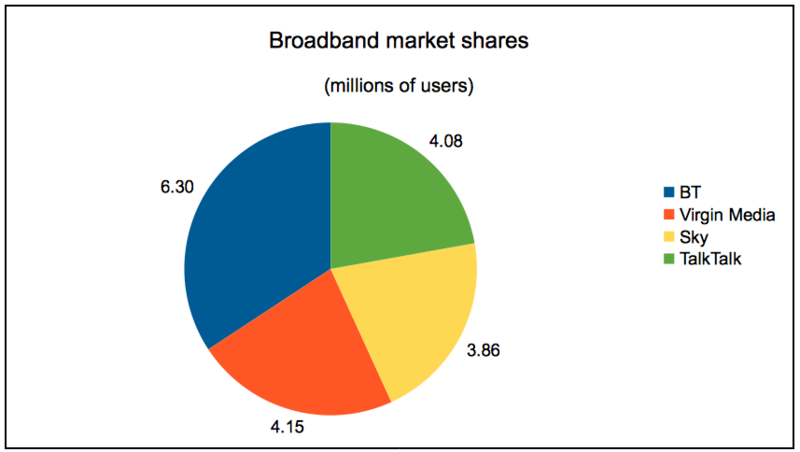 The key figure to look for is the take-up rate of broadband, i.e. number of customers compared to “homes passed”. It’s been running at 5% or less, mainly because it’s been duplicating Virgin Media’s coverage footprint, and just can’t compete. Is someone fiddling the broadband numbers, and if so, why? INTUG, the international telecom users group, believes that officials in charge of Europe’s broadband roll-out are being misled by “vested interests”. It has written to Europe’s Digital Agenda boss Neelie Kroes, asking for the source of the claim that the UK has full coverage for basic broadband. The claim was made in a Digital Agenda working document that said, “Denmark, Finland, France, Luxembourg, Latvia, Malta, Netherlands and the United Kingdom) have already achieved full coverage for basic broadband services”. INTUG told Kroes, “Our UK Member, CMA (Communications Management Association), and the UK Federation of Small Businesses (FSB) met recently with OfCom and UK government representatives …to discuss broadband roll out. It was clear from the discussion that full coverage for basic broadband is still far from being achieved in the UK. Br0kenTeleph0n3 revealed in March that BDUK’s coverage maps exclude wireless coverage, even wireless networks that local councils are using today. Sources say that BDUK is also worried about the accuracy of the maps of physical infrastructure such as street cabinets. Apparently BDUK’s maps show cabinets that are often 1km out and one is known to be 5km out. This, of course, drastically affect the ‘reach’ of BT’s Infinity broadband service, which one source put it, “goes 1300m with a following wind, and broadband itself which dies at around 5km”. A further problem is that only Openreach engineers can tell the actual line length between a street cabinet and a subscriber’s house, and the information in BT’s asset database does not always reflect the actual situation. These inaccuracies mean local councils may be making investment decisions using information that is wrong and potentially misleading. We understand that BDUK is at last starting to worry about these issues as it prepares to release almost £400m to local councils to spend upgrading the networks in their “final third” areas. I should have spotted this earlier – sorry, folks. Vince Cable’s department (BIS) is looking to reform the competition law to make it easier for small business to challenge anti-competitive behaviour and to sue for damages they have suffered as a result of such behaviour. The consultation opened on 24 April 2012 and will close on 24 July 2012. BIS says a strong competition regime is fundamental to growth in the UK economy, to investment and innovation and ensure that consumers get the best deal possible. to promote fairness by enabling consumers and businesses who have suffered loss due to anti-competitive behaviour to obtain redress. The impact assessment that accompanies the consultation says cartels in the EU force up prices by between 28% and 54%. “The process of pursuing (anticompetitive behaviour) cases through private actions is costly and complex,” BIS says. “This is particularly true as competition cases may involve very large sums but be divided across many businesses or consumers, each of whom can only claim a small amount. You can download the consultation from the BIS consulttions website or by following the links above.